Peachtree Mower Company is Georgia's home of the original front throw reel type mower. Servicing Georgia, Florida, South Carolina, North Carolina, Tennessee and Alabama, Peachtree Mower Company is the Southeast's leading seller and service center for reel mowers including California Trimmer, Tru-Cut, and McLane brands as well as the exclusive dealer of the Legacy line of reel mowers. Since 1959 our goal has been to be the best at what we do, showing customers how to get a putting green type lawn and providing the best service after the sale. We are third generation family owned and operated. 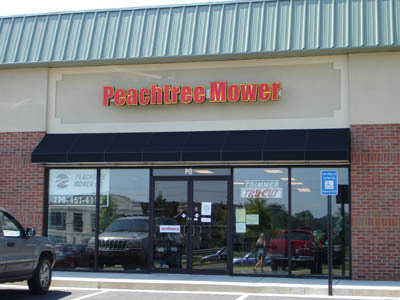 The family at Peachtree Mower Co. would like the opportunity to treat you like family. Peachtree Mower Company is now your one-stop-shop for all four brands of power reel mowers including California Trimmer, Tru-Cut, McLane and Legacy. We are now stocking the special order 20 inch McLane reel mower with the commercial Honda engine. Come see the difference the honda engine and a front smoothing roller make in the handling and performance of the McLane reel mowers. New This Year, Our Extended Warranty Program! With the purchase of a new or reconditioned mower which carries a 1 year warranty, the warranty will be extended for another year if the mower has our recommended Full Service within 12 months of purchase. Front roller is $180.00 if desired. We now have gift certificates for birthdays, Christmas, or just to show someone how much you appreciate them. They may be applied to goods and services at Peachtree Mower Co. Inc.